What is Choriomon (Chorionic Gonadotrophin) used for? Choriomon is a fertility treatment for women. It contains the active ingredient Human Chorionic Gonadotrophin or HCG for administration by intravenous injection or subcutaneous injection. Choriomon increases ovulation by suppressing luteinizing hormone response to gonadotrophin-releasing hormone. HCG is also used by some people for weight loss. How should I use Choriomon (Chorionic Gonadotrophin)? The dosage of HCG in each pack is 5000IU. 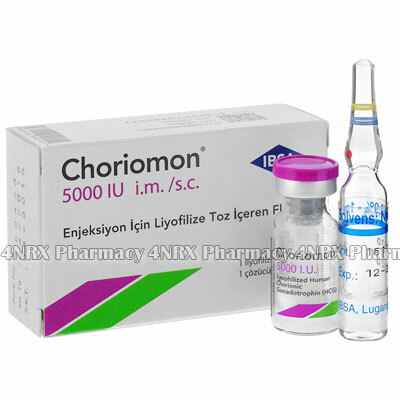 Choriomon is injected into the muscle (intramuscular injection) or under the skin (subcutaneous injection). Once the powder and solution are mixed, the resulting liquid must be refrigerated at all times and used within 40 days. What are the side effects of Choriomon (Chorionic Gonadotrophin)? Notify your doctor if you become aware of any of these.